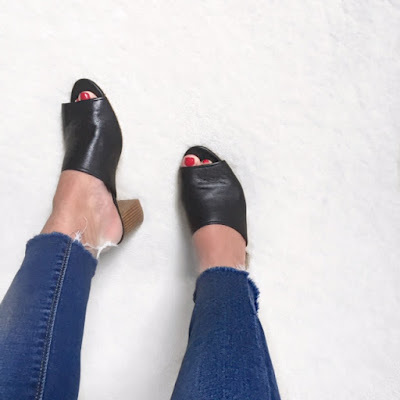 All I wanted was a simple pair of block heeled everyday black mules - easy, right? From a sizing point of view (and ignoring the fact I have pregnant feet), mules appear to be all over the place (evidence in at least 10 pairs I've tried). Some suit skinny feet, clearly obvious by the insane volume of heel hangover, meaning that you need to go up TWO sizes just to get your foot in!!! This makes for uncomfortable eye contact with the delivery guy when the huge boxes containing several sizes of just one shoe keep arriving. So here we are - I've now found the ones (in my world). These are the softest of buttery leather and insanely comfy. Size wise - perfect. Buy here. Also available in white, silver and gold. Humblest apologies that there is just the one quick shot of these shoes - pending baby arrival is making getting out to shoot a little tricky. Normal service will be resumed shortly. I predict these are going to get A LOT of wear with everything from jeans to denim skirt and summer dresses - Keep an eye out over on Instagram for them over the coming weeks. Before I go... There was these. That's reaaaaalllly bad - you know you're being judged! I can't link to the bow mules, where are they from? ?